I've been taking care of Tran, my cousin's wife who recently gave birth to a beautiful little girl. After I pick up little Aria from preschool, I drive directly to Tran's home. Last night's dinner was a one-dish meal. 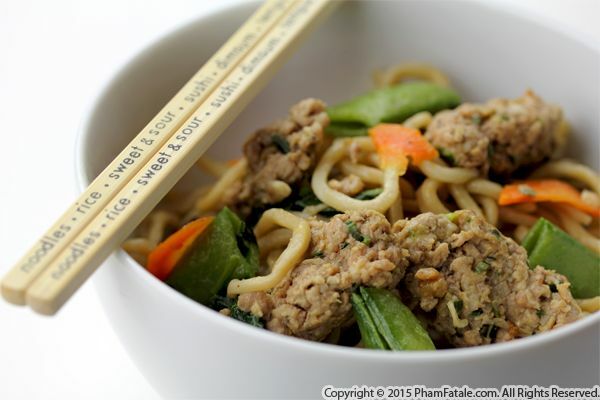 I stir-fried egg noodles with sliced carrot, sugar snap peas, baby spinach and ground turkey. I love the sizzling sound of stir-fry vegetables and noodles in the wok. There was no need to add liquid to the dish as I cooked the ground turkey first and returned it to the wok with its drippings at the last minute to add extra flavor to the soft noodles. 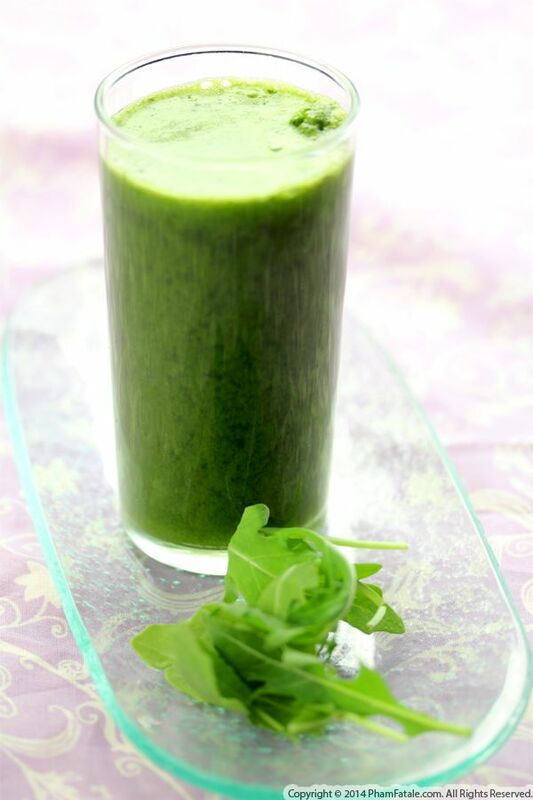 My friend Carole and her husband have been so keen on making juices, she often gives me suggestions on how to create new drinks with my powerful blender. Today's healthy juice is a blend of pure, freshly pressed apple juice, fresh cucumbers, baby kale, spinach leaves, lime juice, chia seeds and a lot of ice cubes. The chia seeds add a beautiful consistency to the juice, which can otherwise seem a little flat. They are loaded with health benefits, so if you want to start the day on a wonderful note, take a few minutes to prepare this "superfood" drink and remember to consider adding more greens to your daily life. 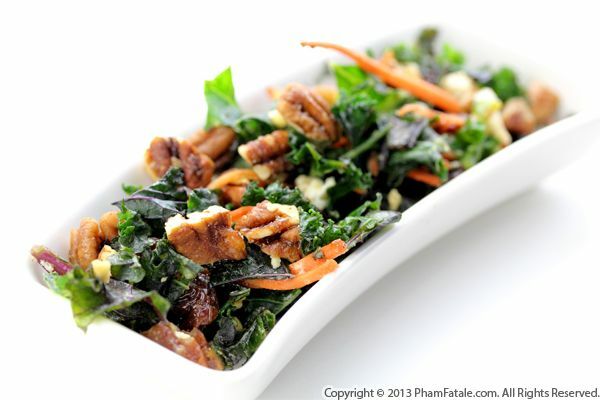 Unlike many items on fast food menus, this kale salad should cause no alarm if super-sized. 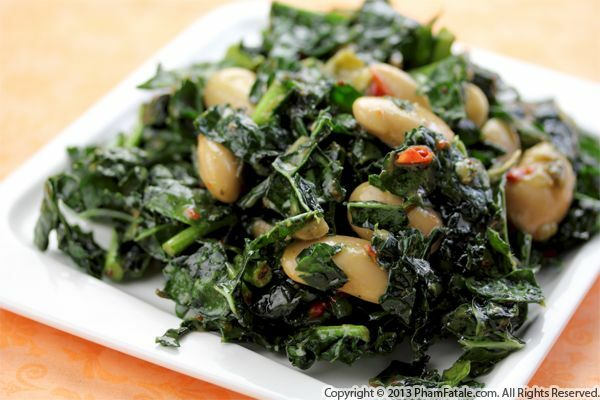 Kale leaves are massaged and marinated in a delectable white bean vinaigrette. The beans used were very creamy inside, so I mashed a small portion to thicken the texture of the dressing. These Greek white beans are unusually large (compared to the standard beans) and are aptly called "gigante" beans. They have a toothsome bite, which helped balance the texture of the salad. I also added sun-dried tomatoes for a pop of color. Serve this complete, nutritious salad with garlic toast and you'll have a light, healthy, yet tasty meal. After learning how to make so many Indian dishes from my husband's paternal grandmother, I noticed that most meals were served family-style with chapati bread, naan, or basmati rice. Our guests love Indian cuisine, so I started to include a few of my favorite dishes, made into bit-sized portions. I love serving finger food. It allows your guests to easily mix and mingle right before the more formal sit-down part of the meal. 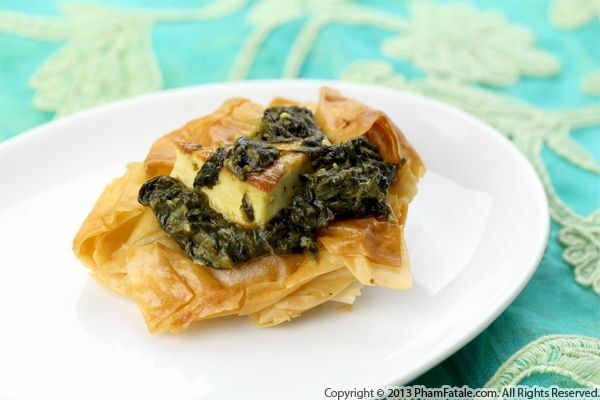 Palak paneer phyllo cups are one of the many appetizers I've developed over the years. These spinach appetizers require 4 steps: forming the phyllo cups, pan-frying the cubes of paneer cheese, making the Indian spinach and cheese filling and assembling at the last minute when the guests are about to arrive. I usually do the prep way in advance so I can have a stress-free party and start the evening in a good and calm spirit.